Water moisturizer with essential oil and flowers Orange, Lavender and Chamomile extract, exclusively formulated with hydrolates arising from the distillation of plants rich vapor stream aromatherapeutic properties, beneficial for the body and mind. It gives freshness and dynamism, moisturizes and tones the skin while also positively influence the psyche through olfaction. The fresh fragrance, deliciously fruity and soft, from the combination of floral accents dell'Arancio and innocent notes of lavender, regenerates the mind, remove stress. A treat for the body and the senses, in one gesto.Per seekers scented water that reveals the elegance of the wearer. Product based on extracts of Lavender and Chamomile biological origin traceable to the METROZERO Program Designed for the unique needs of dry and sensitive skin, they need a regenerating, soothing product, refreshing. Alcohol, therefore, suitable for all skin types, even the most sensitive, can also be applied several times a day to hydrate and refresh, without staining clothes. For more information about ACTIVE INGREDIENTS of your cosmetic consult the dedicated section. Crema spray molto pratica e funzionale idrata senza ungere o appesantire in modo eccessivo. Molto pratica in estate e quando non si ha tempo di stare a spalmare la crema "classica". Profumo stupendo come tutti i prodotti arangara. Semplicemente stupendo, soprattutto, da spruzzare la sera prima di andare a dormire, rilassa ed idrata al contempo. Sono già alla terza confezione e per me è un “mai più senza”! 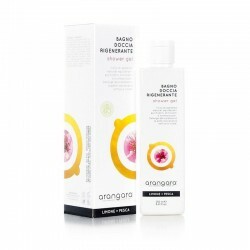 The ingredients come from certified organic cultivation of Azienda Agricola Arangara, they are a guarantee of quality and effectiveness. Find out where and when the raw materials used were harvested in this product with our traceability program of the production process METROZERO .